No number of dust collection systems, filters, vacuums or masks can keep dust out. Ya gotta love it! I have a small bench sander I use to finish automata components on. It has a 6" diameter sanding disc and a 3" wide belt. This size is suitable for most of the work I do. I use the disc face often to sand to a finished line on a paper pattern temporarily glued on the part rather than to precision cutting that still ends up need a sanding touch up. This is not a expensive piece of machinery. Mine is a Delta purchased from a local woodworking shop. I have the sander mounted on a tall stand that places it above 50" off the floor. This allows me to get a good look at the sanding face when woking and not strain my back hunched over. I am 6"-1" tall. The only thing that frustrates me sometimes is the dust extraction ports. Using the belt the dust gets gathered fairly well but the the port into the area around the disc is fairly small and does not collect dust really well. Every time I change paper on the disc I clean out the port that packs up with fine sawdust. It is the only thing that bothers me about the sander. When this one dies, and i replace it I will pay more attention to this, in the mean time I will boost up my extraction system. I also have a smaller bench sander with a 1" vertical belt. I use it for sanding the inside of poorly cut gear profiles and for quick rough shaping of character parts. I do this freehand above the table surface and vertical backing guide. It requires a gentle touch. Not for the faint of heart. Usually the pieces are tupelo or basswood and the load is not great. This is another of those "best thing since sliced bread" tools. It is a 1/2" Proxon belt sander. It is shown below sitting in its storage case. The foam block is just to prevent it from flopping around in the case. The sanding arm rotates through 45 degrees, either straight out, or 45 degrees down as it shows in the photo. It is variable speed. It's the best solution which after you have assembled everything you find the little error you made. 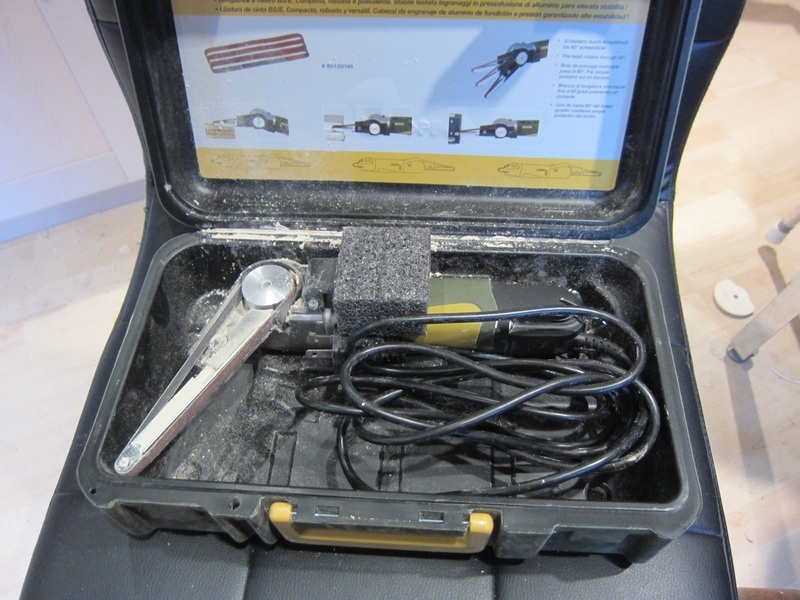 This sander can reach into the mechanism to remove material from cams or other parts. Great tool. There are a couple of small cutting tools that require special mention. One is a flush cutting saw. Two are pictured in a photo below. It has kerf on only one side of the blade and is therefore used for cutting on flat surfaces without leaving marks. The principle use for this tool is cutting ends off plugs, but I have used it for many other purposes when making automata figures. I remind model 'A'. They are available from Lee Valley Tools. Another small saw is what is commonly known as a "gents" saw. 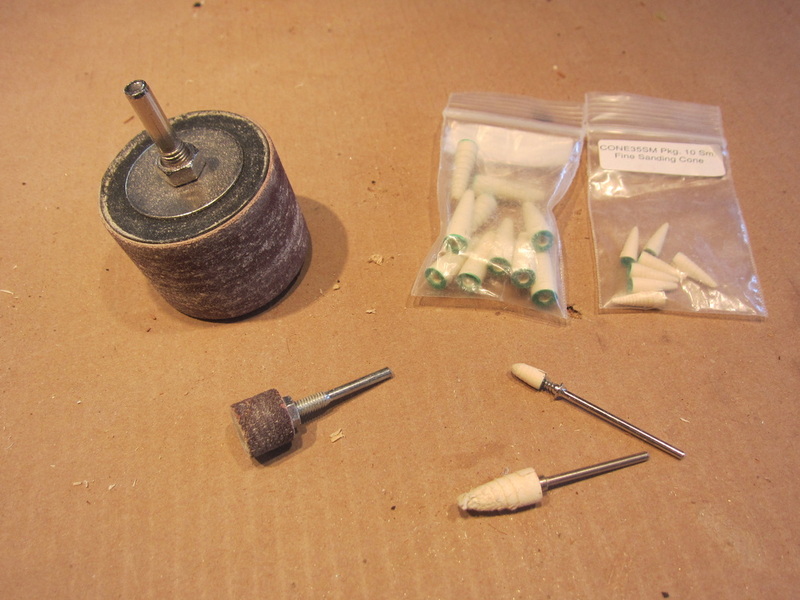 It has fine teeth and a rigid back and I use it for cutting many small pieces and small diameter dowels. It is the one shown in my small miter box cutting an eyeball off the end of a dowel. I often use it with the miter box shown but care must be taken to avoid cutting into the aluminum! It was also purchased from Lee Valley tools. There are some cheaper small saws out there to use for making fine cuts. Xacto sells one through many craft stores. Eventually it always comes down to hand sanding!